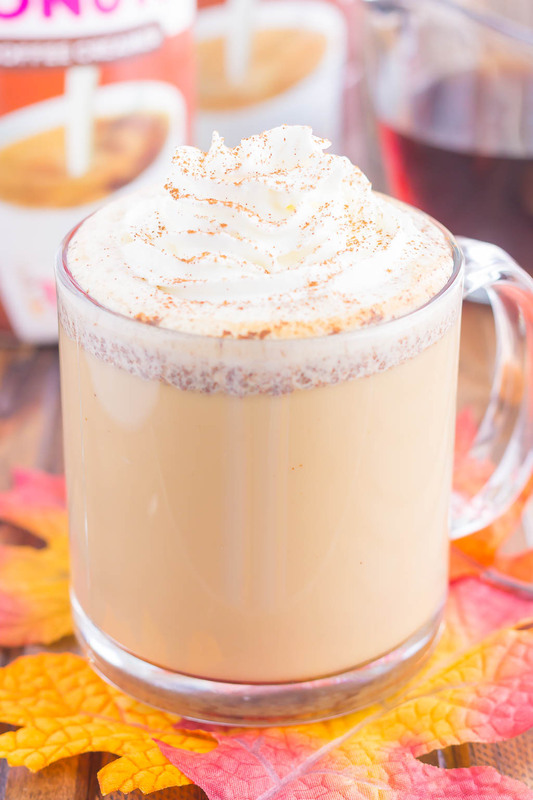 This Cinnamon Maple Latte is filled with cozy fall flavors and is perfect to enjoy during the season. 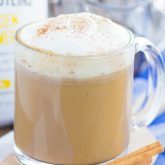 Packed with hints of maple, cinnamon and nutmeg, this homemade latte was made for coffee lovers everywhere! Have I talked about my love of coffee before? I know I’ve mentioned it, and if you’re following me on Insta-stories, you see my ‘flavor of the day’ every day, but have I really confessed to you my love for this liquid gold? I must admit that I don’t really drink coffee for the caffeine. Sure, it helps get my day off to a great start, but I could drink a cup (or five) before I go to bed without being affected by the jolty, jittery rush. Not sure if that’s a good or a bad thing, but I drink coffee solely for the taste. I’m hooked! I’m also a bit of a coffee-snob, so to speak. Snob, in that I can’t drink just any coffee. I usually never order it at a restaurant because I don’t care for the taste, and I can never walk into a coffee shop and just order a plain coffee. It has to be a latte or some kind of flavored coffee, as the regular kind is usually too strong or bitter for me. Unless we’re talking about Dunkin’ Donuts®..I could drink their regular coffee for days! And that’s why I love making coffee at home. I will admit that I add cream and sugar. I’ve tried drinking it black, but it’s just not for me. When I make it my way, I opt for my beloved Keurig and like to experiment with different flavors and creamers. It’s the little things in life that make me happy! And since fall is finally here, you can bet that I’m cozying up with all of the flavors of the season. From pumpkin this to cinnamon that, my coffee puts me in the fall spirit just about every day. 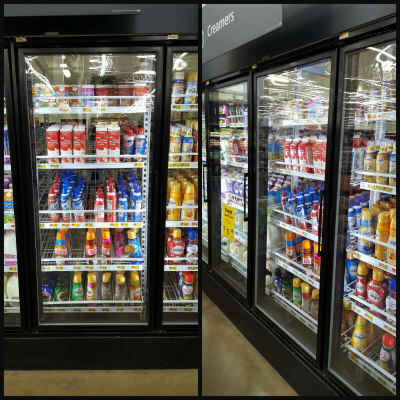 When I was at Walmart a few weeks ago, I stumbled across Dunkin’ Donuts® Coffee Creamers. Just seeing the name gave me all the feels, as I love their coffee. 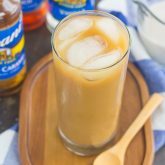 And with flavors like Dunkin’ Donuts® Extra Extra Creamer, Dunkin’ Donuts® Extra Caramel Creamer, and Dunkin’ Donuts® Extra Vanilla Creamer, you can be sure that your cup of coffee is extra creamy, and extra flavorful. 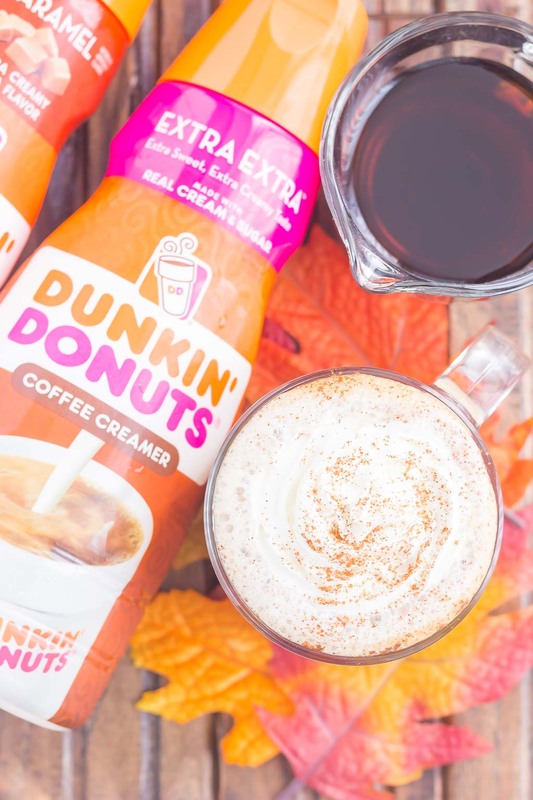 Dunkin’ Donuts® Extra Extra Creamer is made with real sugar, milk, and cream that results in a rich and smooth taste. Dunkin’ Donuts® Caramel Creamer is made with only real can sugar for an authentic caramel taste. It’s like stirring homemade caramel into your cup! 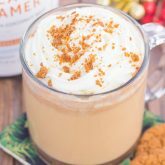 These creamers are perfect for adding to your morning cup of coffee or for making fall-inspired treats. If you’d like to learn more, check out this site and Walmart’s page to see how you can find some deliciousness! So, of course, I stocked up on Dunkin’ Donuts® Extra Extra Creamer and Dunkin’ Donuts® Caramel Creamer and headed up to make my own flavorful latte. And just incase you didn’t notice, I’m embracing fall everything around here. So it only seemed natural that I take my love for coffee and make a warm, fall-inspired drink. 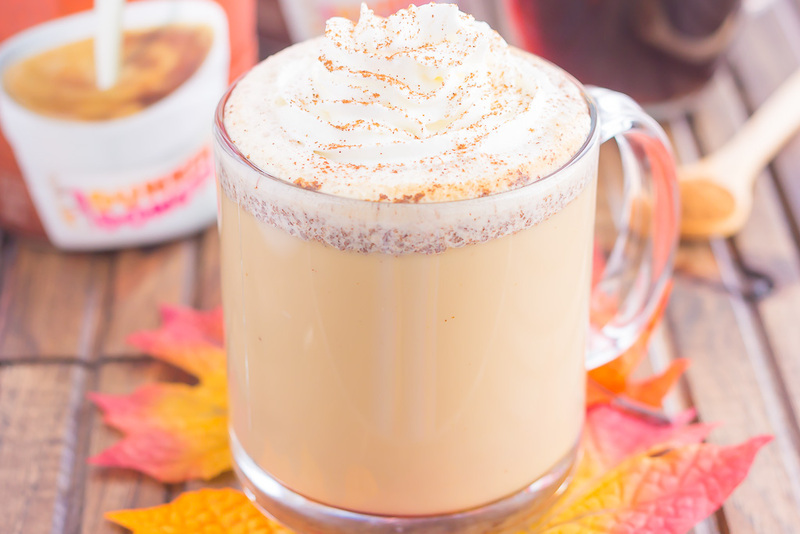 This Cinnamon Maple Latte is just what you need to cozy up with for the season. Warm flavors and a hint of fall will give you all the feels, friends! And did I mention how easy this latte is to make? You can skip the coffee shop order (and calories!) and whip up your own in no time. To start, you’ll want to brew an 8 ounce cup of coffee. Stir in some maple syrup, cinnamon, and a pinch of nutmeg. Then, in a small saucepan, heat the milk and Dunkin’ Donuts® Extra Extra Creamer. After the milk mixture is warmed, it’s time to froth it! I used my immersion blender to create foam, but a hand-mixer or blender would work well, too. You could also add the mixture to a mason jar and shake, shake, shake! Add the foam to the brewed coffee and enjoy! See how easy it is to make your own coffee shop drink at home? With a fraction of the calories and price of the store-bought kind, you can whip up a delicious, fall-inspired drink in your own kitchen! 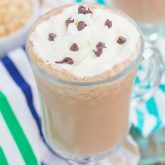 Looking for more hot drink recipes? I’ve got you covered! In a small saucepan, heat milk and Dunkin’ Donuts® Extra Extra Creamer over medium heat until heated through. Add maple syrup, cinnamon and nutmeg to coffee. Stir to combine. Pour into the coffee mug and top with foam. Add a dash of whipped cream and cinnamon, if desired. Like what you see? Then be sure to head to your nearest Walmart to check out their delicious creamers! Sounds like the perfect way to start the day! This reminds me that I need to pull out my milk frother. Tis the season! I tried drinking coffee black too and it's not for me. I usually have coffee cream and trying to twitch to half and half, but no luck yet ;) I love a good cup of coffee too! 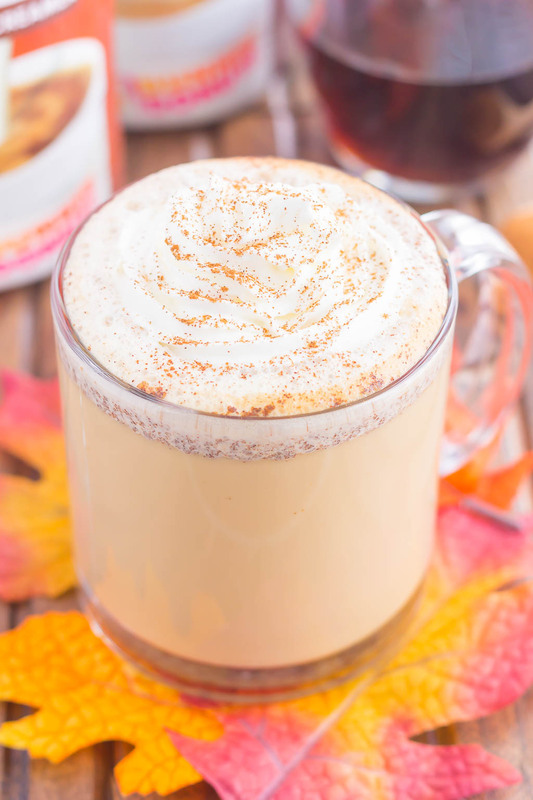 This latte sounds fabulous and so perfect for fall. Hubby makes lattes at home and I've had a bunch of pumpkin spice ones already. Have to try your cinnamon maple one next time! Pinned! Hope your week is going great! Coffee is the best, as are homemade lattes! :) Thanks, Dawn! Bring on all the coffee!! This is such a treat....would actually be a wonderful dessert for me! So much flavor! yes to all the coffee! this sounds so good Gayle! You make the best coffee drinks, Gayle! I mean, who even needs Starbucks anymore?? This latte is seriously calling my name with all that maple cinnamon goodness! I'd sip on this any morning! What a beautiful latte! Love this drink! 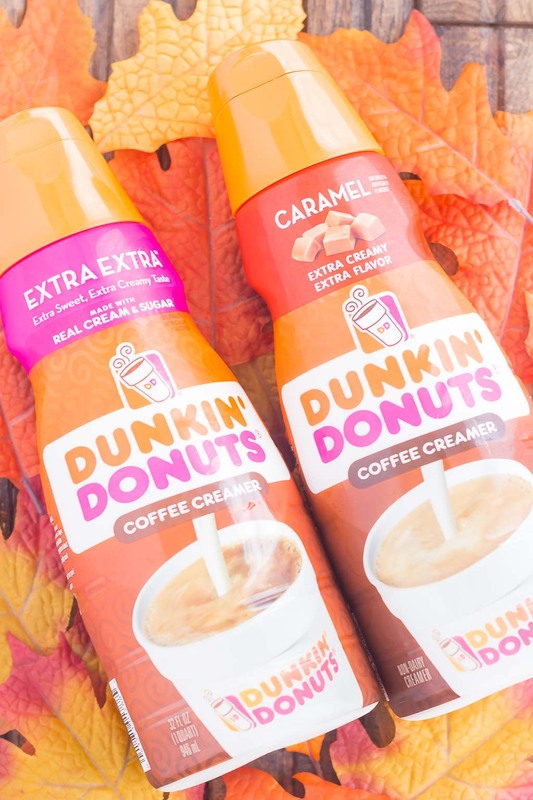 Need to get the Dunkin Donuts creamer and make it asap! That creamer is so good! Thanks, Mira! I love coffee for the taste too, but I need it to start my day. I'm a zombie without it! This sounds like such a delicious way to enjoy the flavors of fall in a cup of coffee!